SELEX Galileo this week marks 60 years involvement in airborne fire control radar with a unique celebration event in London and the publication of a fully illustrated book. Paying tribute to its rich UK-Italian heritage in air-to-air and air-to-surface radar technology, the company exhibited 17 radar sets – ranging from the AI.23 system equipping the RAF’s Lightning fighter to its latest solid-state active electronic scanning array (AESA) products – at a reception to launch ‘Looking Forward: 60 Years of Fire Control Radar’. It was in 1952 that Ferranti – one of the corporate antecedents to what is today SELEX Galileo – began initial engineering studies and technology development work at its site in Crewe Toll, Edinburgh, for the airborne intercept radar that would eventually equip the RAF’s Lightning interceptor. Entering RAF service in 1960, the AI.23 was the world’s first high-power fighter radar to employ the monopulse technique. Its development was a huge engineering challenge, made doubly difficult by the absence of any established component supply base. Virtually everything from the smallest piece parts upwards had to be designed and built from scratch. Engineers pioneered the use of numerically-controlled milling techniques to machine the precisely matched waveguide system from a solid block of aluminium. AI.23 laid the foundations for a high technology business that came to excel in the realm of fire control radar. Products such as Blue Parrot, Blue Fox and Blue Vixen went on to become part of the lexicon of British post-war military aviation. In Italy, the story unfolded in the 1960s when FIAR – another of SELEX Galileo’s forebears – undertook the license build of the North American Autonetics NASARR radar to equip the Italian Air Force’s F-104G Starfighter interceptor. The company later produced the much evolved R-21G/M1 Setter radar, a solid-state evolution of NASARR conferring the updated F-104 ASA with a true look-down/shoot-down capability. Later, FIAR had the vision to invest in the development of a family of lightweight pulse- multi-mode fire control radars, identifying the growing worldwide demand for fighter avionics upgrades. This gave rise to the best-selling GRIFO family, still a leader in its market with more than 450 systems sold and in operations on many different platforms. Building on this heritage of success, SELEX Galileo has gone on to develop the modular Vixen family of affordable, high performance multi-mode AESA radars. It is also part of the multinational Euro radar consortium developing the next-generation CAPTOR-E radar for the Eurofighter Typhoon. "I am honoured to be here today representing years of outstanding individual, industrial and technological excellence," said Fabrizio Giulianini, CEO of SELEX Galileo. "For many years armed forces around the world have relied on our radar to support airborne missions and come home safe. The United Kingdom and Italy have looked at SELEX Galileo, and all its previous incarnations, as the trusted partner to deliver the capability edge to counter enemies and threats." "Building on a continuous evolution of technology and techniques, SELEX Galileo today stands as the cornerstone of Europe’s sovereign capability in airborne fire control radars," says Alastair Morrison, SVP Radar and Advanced Targeting. 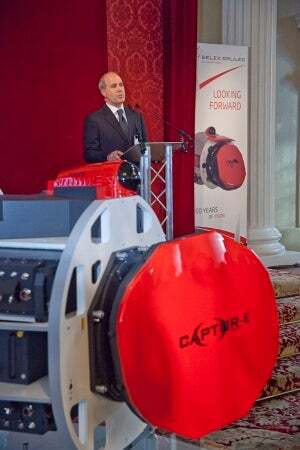 "The company has brought together the complementary experience, knowledge and lines of business from Italy and the UK to create a world-class airborne radar capability uniquely positioned to meet the needs of a diverse and demanding global customer base."